Hi there everyone, I hope both you and your wonderful horses are keeping well, if that is at all possible on such a wet and windy day! So I thought as I hadn’t put out a blog in a little while that I should just recap where we have been and let you know what’s on the horizon for the next few weeks. After the Winter Championships Charlotte and I flew out to America where she was doing another Masterclass. We went to San Diego and then onto Seattle. The Masterclass was a great success, with good variety of horses and riders for the audience to watch train under Charlotte’s watchful eye. As ever it was a great set up by Scott Hayes Productions and his team at the event. Once back to the England I returned to coaching my own clients for a few weeks. I’m happy to say they are all making great progress, especially having come through the winter pushing through the struggles in developing their own riding, and their horses way of going. We have recently completed a crazily manic few days at Somerford Park Premiere League Show. This was part of a great series of competitions around the country, where we can take a group of horses and get in a good selection of tests from Young Horse Classes up to Grand Prix. Charlotte did not take any Grand Prix horses to this show, but took some of her up and coming selection of horses. 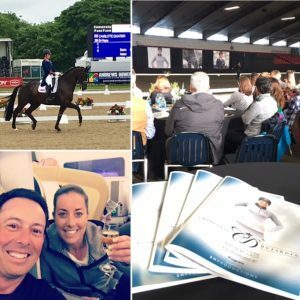 It was a very successful competition, with all the horses pulling out great performances even when stepping up to their next levels. It is such a well run competition, and we always look forward to going back each year. The weather could have been a little kinder to everyone on the Saturday of the bank holiday weekend, but hey I guess we can’t have everything!! Next in the diary is Bolsworth Castle. This is another incredible venue where Charlotte and a whole host of other top riders will be attending. There is also top class show jumping taking place at the event, with riders coming from all over the world. After Bolsworth Castle we head to the Mount St John Open Day, which is the stud based in Yorkshire run by Emma Blundel. Emma owns VIP and the megastar Freestyle that Charlotte trains and competes. The open day is an opportunity for people to see some top class horses and foals, that they hope will continue to make future stars.